Invented in the 1870's, the 12 gauge has only gained popularity over the years. Currently, it is the most popular shotgun in the United States, and due to its easy to use design and exceptional power, it is no wonder how it became so loved. Proven through military, police, and civilian use, the 12 gauge is a versatile firearm for several different shooting applications. Winchester has been around since 1866, and in that time, they have become one of the most prestigious ammunition companies in the USA. 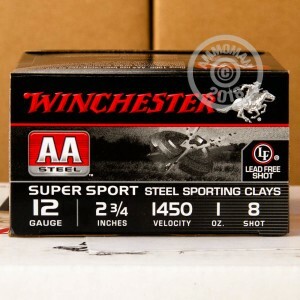 These AA Steel Sporting Clay shells are perfect for those high volume shooting days out on the range. 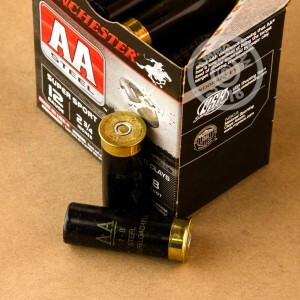 Each shell measures 2-3/4" in length and carries a one ounce column of #8 steel shot. These shells can be used in lead restricted areas. 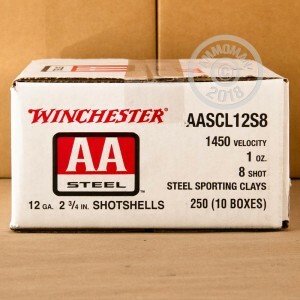 Pick up a couple 25 round boxes today and get out to the range soon! Do you need more than 25 rounds? At AmmoMan.com all orders over $99 qualify for Free Shipping, so stock up and save!